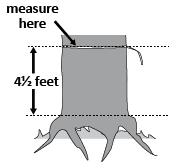 Trees submitted as nominees for the Big Tree Registry must be measured with circumference in inches, and height and crown spread to the nearest foot. 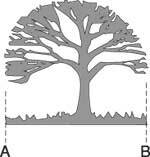 The total of these measurements is the points awarded to a particular tree. 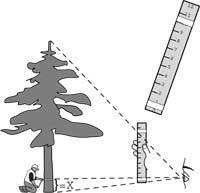 Get circumference by measuring the distance around the tree to the nearest inch at 4½ feet above the ground. A flexible tape measure is a good tool to use. Measure without pressing into deep convolutions or indentations on the tree. Tree with a double stem that forks below 4½ feet above the ground—measure at the narrowest place below the fork. Tree that has forks at ground level—measure the largest stem at 4½ feet. Measure trees that have heaved. When the base of a tree is "heaved" (tree roots exposed usually due to the effects of erosion, along with tree movement and growth patterns)—the measuring point begins where the root mass ends and the tree trunk begins. 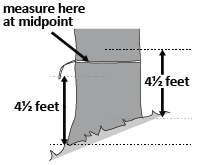 Tree growing on a slope—measure 4½ feet above the midpoint of the different ground levels. Height is the hardest measurement to get. The most reliable method uses a hand level or hypsometer. If these instruments are unavailable, use a ruler and follow the instructions below. On a 12" ruler, mark the 1" and 10" lines with tape. Have a partner stand at the tree’s base. Hold the ruler in front of your eyes at arm length and walk back until you see the whole tree from top to bottom between the 0" and the 10" marks on the ruler. Move your body forward and backward until the base of the tree is exactly at 0 inches and the top of the tree is exactly at 10". Sight out from the 1" mark to a point on the trunk above the base. Have your partner mark with tape that spot on the trunk. 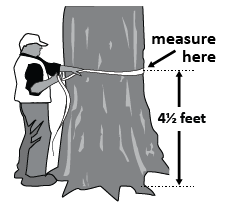 Measure the distance from the base of the tree to the tape mark. Multiply by 10 to get an approximate height of the tree. The trees are under 100 points and within 3 points. The trees over 100 points and their difference is within 3 percent of the total.